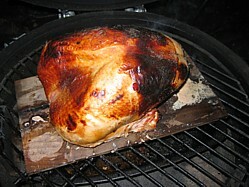 My TIP when plank cooking turkey is to use a marinade to keep everything as moist as possible. The idea behind plank cooking is that the food keeps moist because the plank has been soaked but I find that when cooking something as big as a turkey that the plank dries out so by doubling up with a marinade there’s not excuse for a dry offering! Make sure you’ve go a big enough cooking plank! With salt in the marinade it technically is a brine but it is so weak that there's not worries about the turkey becoming too salty by marinading overnight. To learn more check out my brine recipes page which covers what brine is and how it works. Sorry to all the coeliacs out there, this recipe is your nightmare because there's gluten in many of the ingredients; beer, soy sauce & Worcestershire sauce. In addition the Worcestershire sauce contains fish. In a suitable marinade bowl or bucket, mix up all the ingredients (except the turkey) taking care to ensure that all the salt and sugar has dissolved. Place the brine / marinade in the refrigerator for a couple of hours. 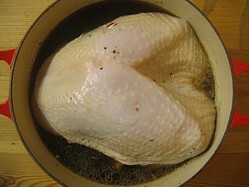 When the brine is chilled, place the turkey in it, cover with stretch wrap and leave it in the refrigerator overnight. 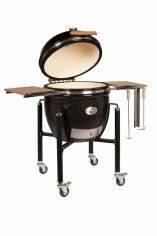 (Whilst salt is a preservative it won't prevent your meat from spoiling so you must refrigerate). If you get the opportunity, overhaul the bird a couple of times so that you get maximum flavour penetration. When ready to cook, remove the turkey from the marinade and pat dry. Place it on the pre-soaked, pre-heated cooking plank and cook for 75 minutes at 180°C or 350°F. TIP 1 - Turkey should always be left for at least 30 minutes when removed from the oven because this allows the cooking process to finish and the juices to thicken so leaving the breast beautifully moist. Leave it for an hour and it will be superb. TIP 2 - Place a drip tray under the plank during the cooking process and you’ll be rewarded with some delicious juice to add in a sauce. When rested, slice the turkey breast and enjoy!